Keeping your favorite course healthy is an important part of the game. After all, you want to stay in the good graces of your greenskeeper. The Callaway 4-In-1 Divot Tool is constructed of durable zinc alloy and features a metal groove cleaner for tough dirt, a magnetic ball marker with Callaway logo, and a nylon bristle brush for general cleaning. Keeping your favorite course healthy is an important part of the game. After all, you want to stay in the good graces of your greenskeeper. 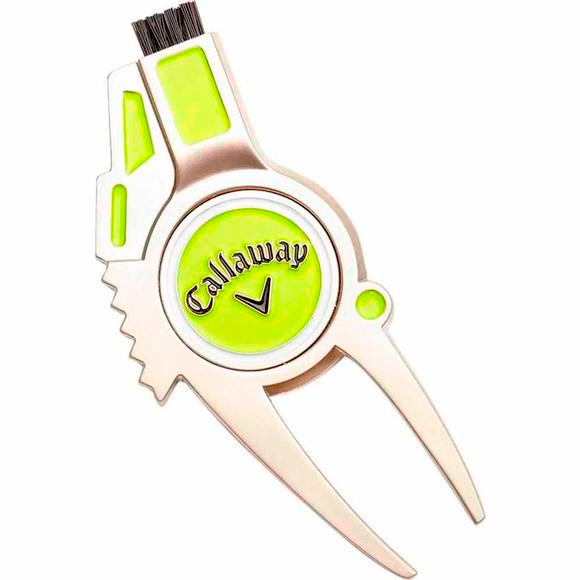 The Callaway 4-In-1 Divot Tool is constructed of durable zinc alloy and features a metal groove cleaner for tough dirt, a magnetic ball marker with Callaway logo, and a nylon bristle brush for general cleaning. This useful tool makes repairing divots easier than a draining a gimme.